10. Elena Cecchini (ita) s.t. Sector 5 is the tonic to ignite the race. It’s 9.5 kms and runs mostly uphill with steepest ramps of 15%. At the end of it a group of 40 riders is adrift. The first chasers are 2 minutes down on them. Just before hitting the next dust road it starts to rain. On the sector itself Lara Vieceli and Lauren Stephens go on the attack, while Floortje Mackaij bridges over. The race to a maximum lead of almost 2 minutes. Coming out of sector 6 Mackaij and Stephens are the only leaders, half a minute ahead of the peloton. They are caught also on the following gravel road and five riders go on the counter attack: Kasia Niewiadoma, Lizzie Deignan, Elisa Longo Borghini, Annemiek van Vleuten and Katrin Garfoot. With 5 kms remaining the first chasers are half a minute down on the leaders. Shara Gillow attacks. Out of nowhere Gillow and Lucinda Brand make contact with the leaders in the final haul towards Siena. Brand and Gillow don’t linger but immediately blow ahead of the five. Brand is alone, but Gillow re-joins her on the sharp climb towards the Piazza del Campo, while the former leaders claw their way back into contention with Elisa Longo Borghini strongest. 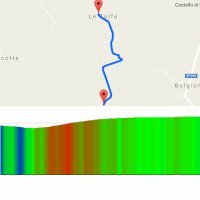 Read about the route of the Strade Bianche for women.